So the timing for this hack couldn't be better. I had a series of scuff marks on my bathroom wall where some accordion mirrors keep banging into the wall when they are opened and closed. I'd begun to consider repainting the whole bathroom because I couldn't clean them off. 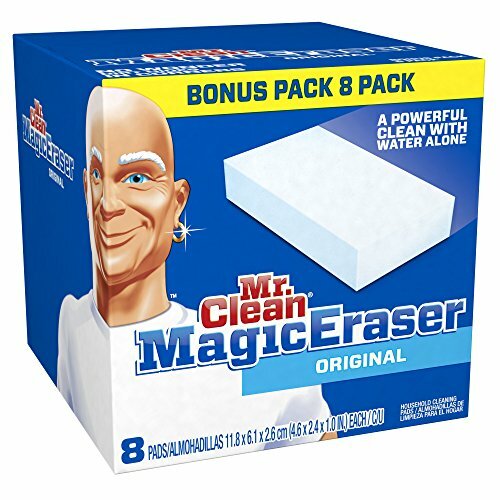 Then my friend Kimberly told me I needed to try a magical clean product. I ordered it up off Amazon and voila. From my doorstep I marched right up to the bathroom and wiped those black scuff marks away just like magic. In this little Day of the Dead-inspired video, I'm a dressed up sugar skull in desparate need of a clean pair of chucks. You'll see one fast transformation. This wonderful little product is something that everyone should have tucked in their cleaning supplies bin. You can nab a box easy enough on Amazon.